This is the first sketch I made in 2000, after a long windy session of fly fishing on inflatable boats at Belis lake, on my friend Heinrich Loth office desk, his answer was: ll finance, you do it! The S1 waterbike has been designed specially to meet the needs of the solo fly-fisherman but it is great for all kinds of fresh water fishing. It allows you to move easily and maneuver with precision, while keeping both hands on the rod and giving all your attention to your sport. The lightweight one-person boat is powered by pedals and steered by the seat, which connects to a front propeller drive and rudder. It is made of aluminum and fiberglass, weighing less than 25 kg, and is easy to transport and assemble. Hands-free steering. The rotating chair gives you full control of your water bike while fishing, leaving your hands completely free for the rod, reels, and fly line. Excellent maneuverability. The pedal power system requires little effort and allows you to move swiftly, turn on the spot easily and position yourself precisely. Good casting position. The chair is 25 cm above the water and gives you the perfect platform for fishing. Stability in waves and winds. The floats and pedal unit give you full control even in strong winds. Silent motion. The hydrodynamic design gives top performance, allowing the water bike to move cleanly through the water and minimising waves. Easy to transport. The four compact folding units have been designed to fit easily into a car boot while the floats attach to a roof rack. Simple to assemble. 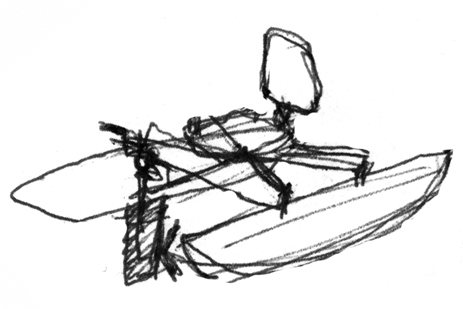 One person can put together the water bike in three to five minutes without tools.